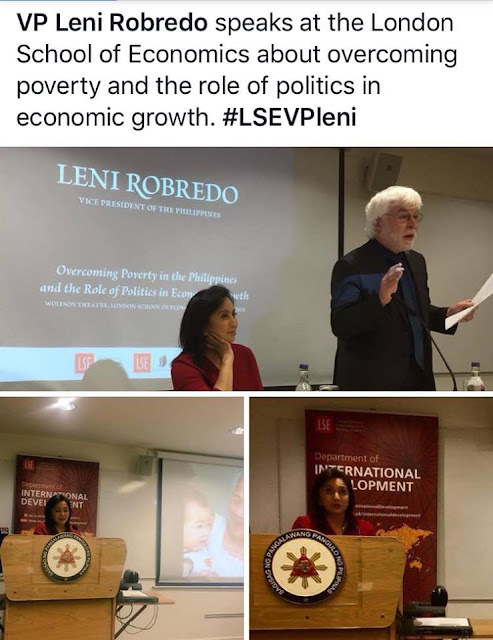 Benjie Daisy Contreras a fellow Facebook netizen from Naga, Camarines Sur pinpoints mind-opening facts on former Vice President (VP) Leni Robredo’s speech on overcoming poverty and the role of politics in economic growth at the London School of Economics. In his Facebook post he questions on why the presented pictures that came with the news that the former VP was giving a speech in a university in London had not covered the students, school officials or rather audience in general or at the very least the open forum. Contreras pointed out that it is possible that no one attended the said speech, that not one British student cared for what the former Vice President Leni Robredo had to say. And what itches Contreras’ head is the fact that the open forum wasn’t even part of the said news. 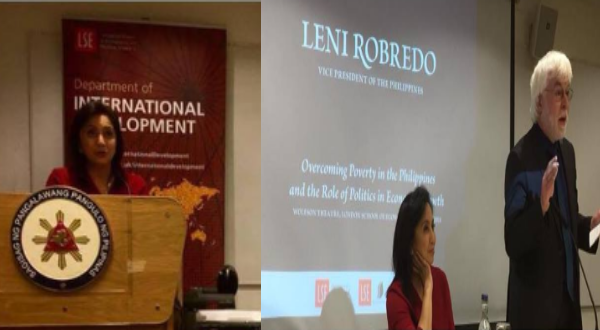 How come Senator Trillanes or even the journalist Raissa Robles have their open forums covered live but Robredo somehow can’t even get a single picture of her interacting with an audience in London? Maybe it’s because they waved the open forum for she can’t answer such an incredibly challenging part of her talk that somehow even the idiot Trillanes could overcome. Or maybe it’s because she has nothing to answer at all, for she’s guilty of what she’s done and ashamed of the hypocrisy of her talk on the poverty of the Philippines. Based on Contreras’ insight, there is also another possibility that may come in mind. The possibility that the entire talk was staged in order for her to grab credibility and publicities. In other sources, Robredo was supposed to help fund Scholarships for deserving British students of the aforementioned school but failed to do so after her project, the “Leni Lugaw” flopped as it could only bring about 50 pounds or 3,650 pesos in total. Such a shameful attempt and waste of money for the school that sponsored Robredo’s airfare, accommodation and other travel expenses. Robredo truly is proving herself to be worthless and useless at the same time, a complete waste of loyal tax-payer’s hard-earned money and one that does not deserve become the Vice President. She has just brought shame to the Philippines after verifying that her failed endeavors were just a part of her experience. Incredibly careless act considering the fact that Robredo’s representing the Philippines as the second highest ranking government official. “Bilang kritiko ng aking kababayang FVP Leni Robredo, ako’y nagtataka sa mga pictures niya bilang speaker sa London School of Economics kung bakit naka-focus ang mga larawan sa kanya lang. Hindi ipinapakita ang audience o ang mga estudyante at school officials na dumalo sa kanyang speaking engagement. Dahil kaya na kokonti ang dumalo at napakaming bakanteng upuan sa pinagdausan ng nasabing speaking engagement??? Bakit walang ipinakitang open forum? Dahil kaya sa dahilang wala nito dahil hindi alam ang mga isasagot sa mga tanong o kaya ayaw mapahiya kung walang ma-isagot? Mabuti pa si Trillanes at Raissa Robles at live na ipanakita ang open forum.